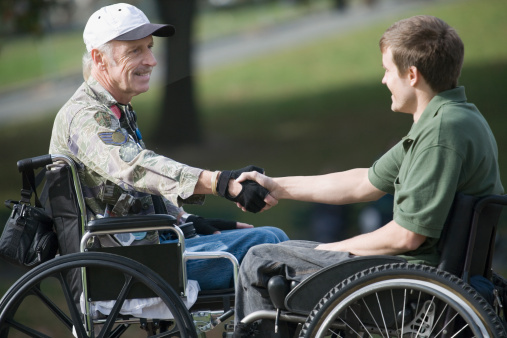 100% Disabled Vets to Receive Expedited Disability Decisions - Harrison White, P.C. Veterans who have become totally disabled in the service to their country can never fully repaid for their sacrifice. They certainly deserve a prompt decision on their disability benefits claims. The Social Security Administration recently announced that it will expedite the handling of Social Security disability applications for some military veterans. The new program applies only to veterans who have a compensation rating from the Veterans Affairs Department of 100 percent permanent and total disability. Veterans who have a 100 percent disability rating may receive a decision in as little as 20 days on their expedited application compared with months of waiting for a decision for other applications. The agency will label these applications high priority just as it does for Wounded Warriors. The programs do not supplant the VA’s disability program; the two are considered separate. Eligible veterans applying for disability must notify the agency that they qualify for the new program and have a copy of their VA notification letter with the 100 percent rating. There is no guarantee that an application will be successful. However, the program’s supporters hope it will reduce the agency’s backlog. Rep. John Sarbanes, a Maryland Democrat and member of the House Subcommittee on Health, said the “common sense change” will cut through red tape for veterans, including those from the wars in Iraq and Afghanistan. Over time, the Social Security Administration has added expedited programs to help certain groups receive decisions faster. Other programs include Quick Disability Determination and Compassionate Allowances, which flag cases with high likelihood of success for faster review.